For #MyEscape we edited material filmed by refugees. Only in depth interviews after their arrival were filmed by us. 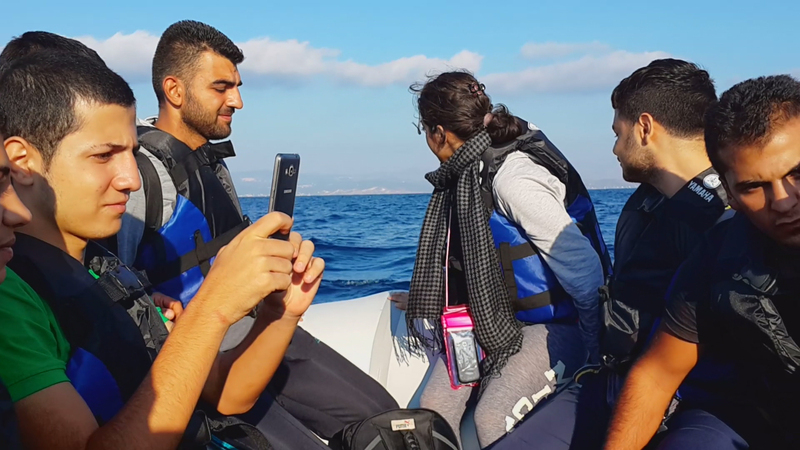 This different perspective is visible in the documentary: It is not a professional film crew filming a broken refugee boat from a safe guard boat. The camera is in the hand of a refugee on a broken boat when suddenly a boat is approaching to rescue them. The camera is also inside an empty trunk, searching for a small hole, for air or hidden while filming traffickers who take the decision on the future of the person, who is filming. It is “my escape” not “their escape”. Mid November 2015 we launched a call on our facebook page in several languages, presenting our idea and asking refugees for their material. The call was also spread by groups and NGO´s and we put it on the walls of refugee camps. Our team with members from Syria, Afghanistan and Eritrea used networks within their communities to spread the call. Soon the first people contacted us or uploaded material on our facebook page. Our team members kept contact with them in their languages, and visited some of them. More and more videos arrived in Berlin. We started loading the material into our editing system and tried to structure it. We also found material on youtube and tried to find the persons who had filmed it or were on it. Some people had filmed their entire journeys. At some point we decided to tell a limited number of escape journeys from the beginning until the arrival, but use the other short clips on our facebook page and for general parts of our film like “crossing the Mediterranean” or “walking through Eastern Europe”. We started to reconstruct the journeys with the help of the refugees who often visited us in our office. We structured their material and little by little the journeys became visible. Then we did in depth interviews in which we asked them to comment and explain their videos. We started editing in January 2016. Again often refugees would come to assist us and help us understand their material. Some of the team members did pre editing, some final editing, some continued researching. #MyEscape was first broadcasted on February 10 on WDR and after February 13 in 3 parts on Deutsche Welle. After that it is participating in festivals around the world. Groups or teachers also use the film to create awareness about the issue.